1. Preheat the oven to 220˚C, gas mark 7. Combine the harissa and olive oil in a large bowl. Add the chicken breasts and sweet potatoes, and toss to coat. Season, then arrange in a single layer in a roasting tray and cook for 25 minutes, until the chicken and potatoes are cooked. 2. Meanwhile, make the dressing: cut the preserved lemons in half, scoop out the flesh and discard. Finely chop the rind and whisk together with the extra virgin olive oil and lemon juice in a bowl. 3. When cooked, remove and slice the chicken breasts on the diagonal. 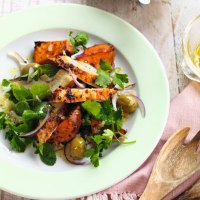 Arrange the herbs, onion and olives on 4 serving plates and top with the chicken and sweet potato. Drizzle the dressing over the salad and serve with a bowl of yogurt alongside.